The Padlock allows you to lock and protect your files, images, folders, documents or any type of file. With this software download take just seconds to lock files, even with several GBs. You just have to drag and drop files and encrypt them. The locked files can not be renamed, deleted or executed, becoming inaccessible in Windows Explorer. Version 4.2.2 is a freeware program which does not have restrictions and it's free so it doesn't cost anything. 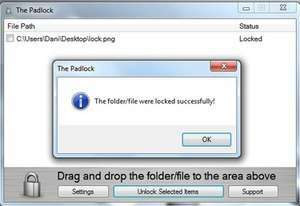 For security reasons, you should also check out the The Padlock download at LO4D.com which includes virus and malware tests. Additional screenshots of this application download may be available, too.